The three-day, two night all women's backcountry ski hut trip in the 10th Mountain Hut Trail System, led by Aspen Alpine Guides, promised ski touring, powder skiing, scrumptious food and wine. Just beyond the stonewalls of the urban jungle, I clicked into my bindings and escaped into the Park's insular winter wonderland, swooshing past dog walkers, giggling kids on sleds and grinning tourists strolling in the shadows of hovering hi-rise buildings. 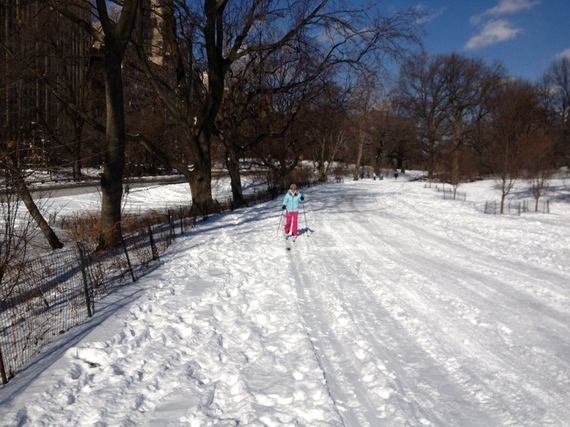 While, fellow urban pals grumbled about our endless snowy New York City winter that left slushy grey streets, I found solace cross-country skiing on Central Park's snowy trails. At lunchtime, I'd often slip away from my keyboard and trudge slick sidewalks with my Fischer My Style skis stacked on my shoulder, past brownstones and the Museum of Natural History, across from the Park's entrance. 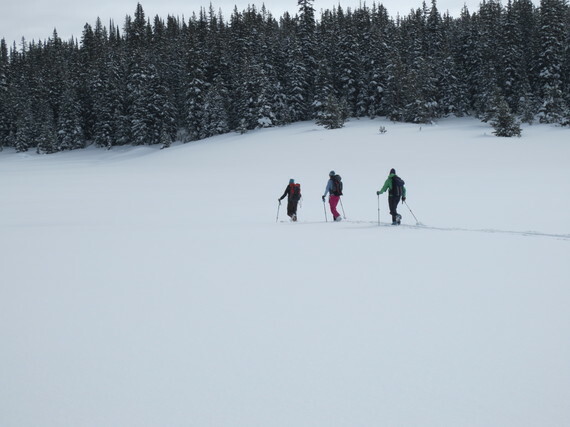 My midday outings were not just recess, but terrific training for my "Leave the Boys Behind" backcountry ski hut trip in Aspen, Colorado, this past February. I arrived in Aspen a day early to visit my high school friend Tracey, who lives locally, and skate ski at Aspen Nordic Center. After spending nearly 24 hours traveling from NYC to Aspen, due to weather delays, I woke early and hit the trails as the morning sun beamed through a thin veil of clouds. The crisp, fresh mountain air was a treat and the surrounding snowcapped mountains were breathtaking. Following a warm up on the groomed undulating Nordic trail circuit, the local golf course in warmer weather, I left the main tracks to follow a trail under a bridge and up a short, steep hill to stride and glide along the rolling James E. More Trail - which connects with SnowMass Village, some nine miles away. Refreshed and famished, I refueled at Spring Café, an organic, vegan restaurant in downtown Aspen. The savory Warm Golden Squash Salad and fresh pressed Carrot Hop juice-a blend of carrots, apple juice and ginger-were delicious and rejuvenating. Later, I met the hut girls and our guides Maureen "Mo" Fox, Maile Wade and Jenny Yurechko at UTE Mountaineer, to gear up with sturdy backpacks, boots, poles, skis and skins. 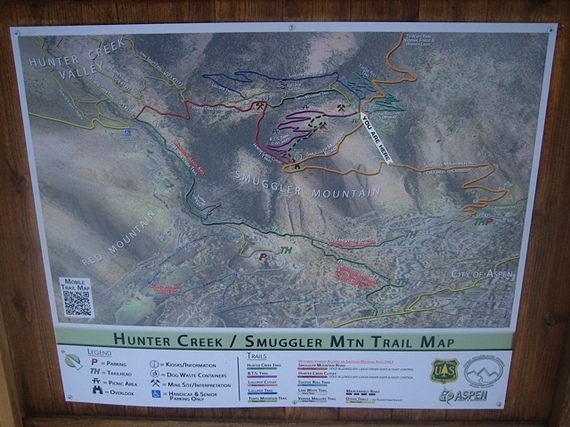 The next morning, after a brief avalanche safety clinic at Aspen Meadow Resort, we headed to the Hunter Creek trailhead (8,600 feet). 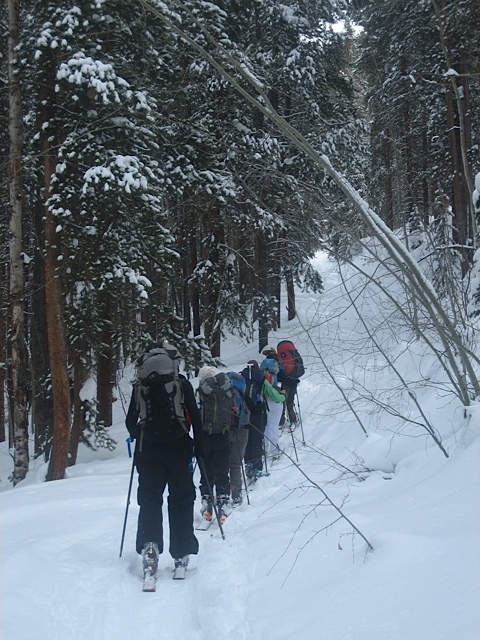 At 11:00 a.m., our backpack clad crew of nine (plus guides) set off ski touring on the 10th Mountain Division trails-marked with blue diamonds on trees like ducklings following Mother Hen. The narrow trail, cut through thick snow-covered forests peppered with Spruce, Lodgepole Pine and Douglas fir. Our group was a mix of abilities and fitness. 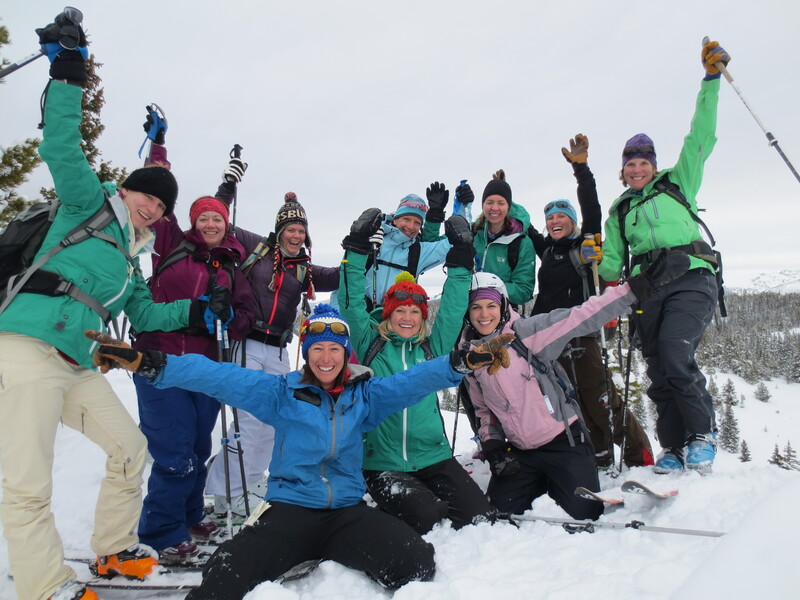 While, some were avid alpine skiers, two women had never skied. I am fit from running, cycling and cross-country skiing. But skinning was new to most. 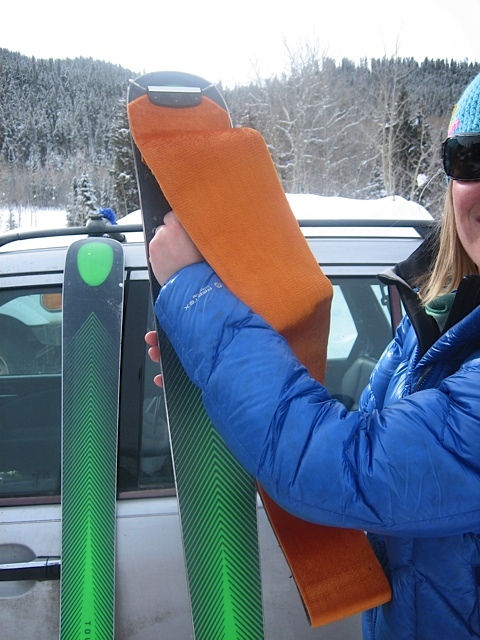 Skins, long strips of furry fabric with sticky backs temporarily adheres to ski bottoms, allowing skis move forward and uphill without slipping back. They're removed for down hills. 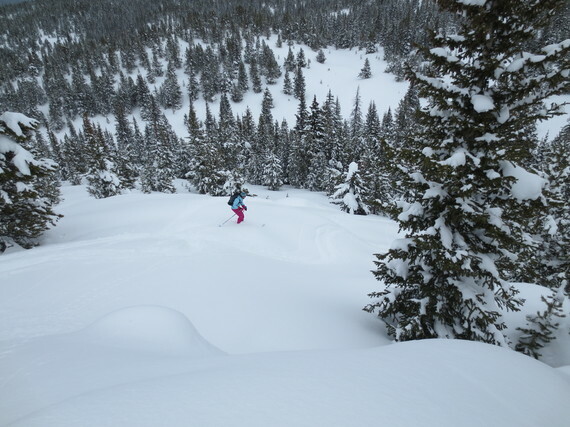 As we advanced toward Smuggler's ridgeline, the trail turned steep and I lifted the heel support on my bindings. Backcountry bindings allow a loose heel for trekking and have heel-risers make steep terrain easier. With a quick twist, binding lock down heel for controlled downhill skiing. The stunning views of the mountains south of Aspen came into focus as we got higher. Other than swoosh, swoosh of skis and snow pants-and labored breath-it was hushed. I methodically inched up hill, sliding a ski forward, planting a pole. Repeat on the other side. My 40-something pound pack, loaded with safety shovel, sleeping bag, clothes, a bottle of wine and jar of tomato sauce, felt notably heavier. But Mo-who works ski patrol at Aspen Highlands-and Maile-former Aspen ski patrol and mountain guide, who works for family's store, Ute Mountaineer, pulled 60-pound red plastic sleds filled with food and necessities. Metal rods attach the sled to a waistband, which synch's around hips. Always curious, I tried pulling a sled. It was jerky on flats and a calorie crusher on up hills. While, down hills were tricky managing speed and balance being pushed forward from extra weight. It required focus and core-stabilization. As we reached the top of Smugglers Mountain Range, the trail leveled. We stopped near a sprawling meadow quilted with hip-high virgin snow to nibble snacks, regroup and ready for the final steep climb to the hut. At 4:00 p.m., after five hours and five hilly miles, we reached the Fritz Hut (10,970 feet)-our home for the next two nights. 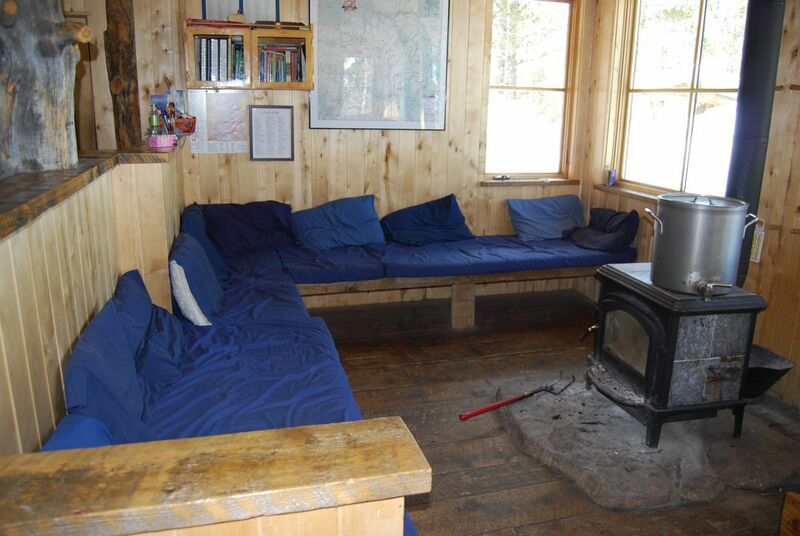 Its one of the 34 huts connecting 350-miles of noted 10th Mountain trail routes, created to memorialize U.S. soldiers of the 10th Mountain Division, who trained nearby during World War II. Fritz and neighboring Fabi Huts, were built in 1997, in memory of husband and wife Fredrick "Fritz" and Fabi Benedict, who where were influential in the Aspen Institute. The rustic furnished, three bedroom wooden hut was cold, but it felt great to take off my cold, stiff ski boots and take off my damp clothes. When I emerged from my room, Mo and Maile had a fire roaring in the wood-burning stove to heat the hut and melt snow for drinking water. 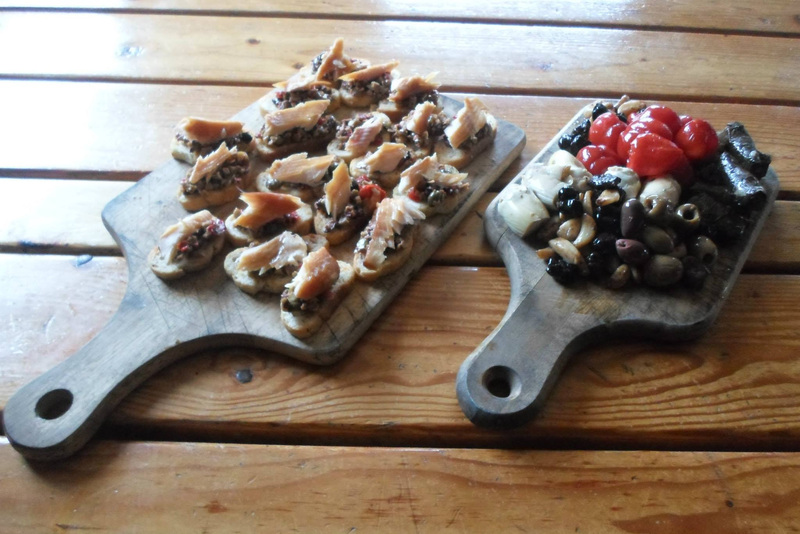 While, Jenny was busy in the kitchen cooking tomato soup with lump crabmeat and crafting a spread of smoke trout bruschetta, dried meats, mozzarella, olives and hummus. Since I run a wine tasting company in New York City, I organized a wine and chocolate tasting using Paonia, Colorado wines and dark chocolate. The dry Riesling paired with spicy orange dark chocolate was the crowd-pleaser. The rest of the trip was like summer (uh, winter) camp. In the morning, blueberry pancakes breakfast with endless conversation morphed into fresh power skiing. 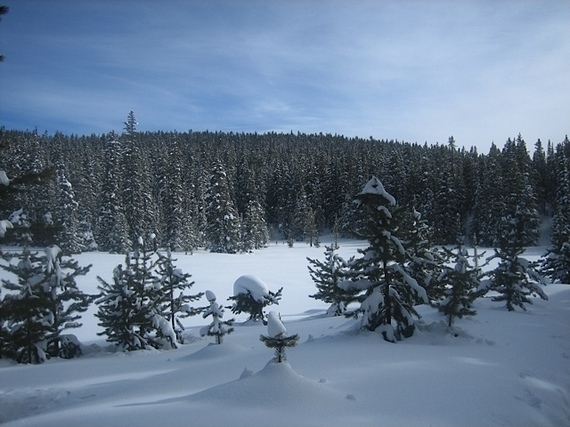 We skinned across sparkly snow-blanked meadows and up tree-lined hills. Then, removed skins to carve turns on fluffy, fresh snow down hills. We returned to the warm hut for a belly-filling bison or veggie chili and salad lunch, followed by an afternoon ski session. Then it was time for apre' ski wine, dinner and a ferocious game of Cranium. Upon returning to Aspen, I luxuriated at Aspen Club & Spa with a massage and indulged in a delightful tasting dinner at Element 47-wines were selected by Carlton McCoy, 29 year-old Wine Director & Master Sommelier. Aspen is truly beyond the "quiet years."